APPEARANCE: Accents of orange panels are added to give the atmosphere unity and excitement. 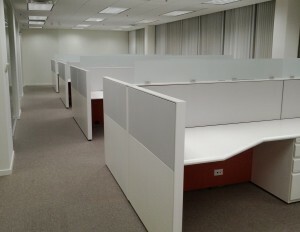 ECONOMICS: A small area was given to fit as many staff members and provide a large work area. In order to accomplish this, corner work-surfaces were used instead of return-surfaces to operate the space effectively which generate the feeling of spaciousness within a smaller workstation footprint.